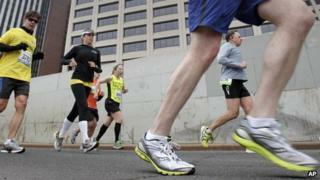 London Marathon entrants have a month of training left for what's seen as one of the greatest feats of human endurance. Yet Irish twins Jedward claim they completed the Los Angeles marathon without any training. So is it possible to run one on a whim? For most runners, a marathon is not just 26.2 miles of physical endurance - it means months and months of arduous, painstaking preparation. Typically, those signing up commit to long periods of meticulous planning, a careful diet and a regimented programme of progressively longer runs. And yet those limbering up for the London Marathon on 22 April can be forgiven for feeling galled by Irish pop singers Jedward - aka John and Edward Grimes - who claim to have completed the Los Angeles marathon on a whim, straight off a flight and with no training. Such an accomplishment flies in the face of all the advice offered by the medical world and the running community alike. With the body under considerable stresses and the race consuming an entire day's worth of calories, conventional wisdom says completing a marathon is a physical ordeal for which you have to prepare. Add cramps, chafing, dizziness and dehydration into the mix, and the 26-mile mission can push the human body to its limits. People can even die running both marathons and half-marathons. In the first 30 years of the London Marathon, 10 competitors died, with eight of those cardiac cases. Sportscardiologists recommend screeningfor many runners. Jedward are not the only figures said to have completed a marathon without preparation. Former athlete David Bedford, now race director for the London Marathon, apparently only chose to enter the 1981 race in the early hours of race day, while in a nightclub. He had been challenged by none other than Grandstand commentator David Coleman. After stopping on the way home for a curry, according to his own account, Bedford duly completed the course - although he was filmed throwing up midway through the route. Death -Running a marathon or half-marathon can be fatal. One of the worst recent death tolls was in the 2005 Great North Run, where four people died. Cardiac arrests are frequently the cause, but hyponatraemia, brought on by drinking too much water, has also been blamed. Dehydration- the body loses fluid through sweating and breathing. An above average runner doing a three-hour marathon could expect to lose 3-5 kilograms of weight. For every kilogram you lose, you need to drink 1.5 litres of water to replace it. Sweat also contains salt (mainly sodium and potassium) so up your salt intake. Injury- Knees, calves, shins, ankles, hips and heels are all susceptible to being damaged from constant pounding, while muscles experience micro-damage. Runners need to factor in plenty of post marathon rest time because injuries can also occur after the event. Cramp- This occurs when fatigue and dehydration cause the muscle to tighten up and become incredibly sore. People have had to pull out of races for cramp before. Andrew Gertig caused consternation in running circles when he announced he had finished the2003 San Francisco marathonin four hours 28 minutes without any training. And when Eddie Izzard ran 43 marathons in 51 days, the comedian admitted he only began preparing five weeks before. Not all have been so successful, however. The reality television star Jade Goody was hospitalised after attempting the 2006 London marathon without meaningful training. So how difficult is it to run a marathon without putting in the leg work? For American Sean Ogle, 26,running a marathon on almost no trainingwas not something he set out to achieve. But he is testament to the fact it can be done, albeit in a modest time of five hours and 29 minutes. Ogle began training for the Eugene marathon in Oregon, held on 1 May 2011, in January of that year. But he kept up his training for just three weeks. Then he was compelled to travel more regularly for work, and picked up a shin injury, so he stopped. "Before I knew it, it was three weeks before the marathon," he recalls. "I'd paid $100 to enter, I wanted to do it, so I decided to run three miles to see if I could. It was hard, but it made me think, maybe I can walk this thing." Ogle says he turned up to the start of the race with his new plan, but then something happened. His ego kicked in. "There were a bunch of 10 women between the ages of 50-60 next to me and I didn't want to be the guy holding them up. So I decided to run for the first mile, which went to three, and somehow I kept going. "By 18 or 19 miles, I was walking at the end of every mile for 30 or 45 seconds. I'd stretch my leg on a tree or something. "I'd heard all the stories about crashing at 22 or 23 miles, and I didn't know what was going to happen. All I knew was I was getting closer." Ogle says he was overcome with emotion and pain when he actually managed to cross the finish line. For the following week he could barely walk as far as his local shops. Plan and prepare. "It's important to give the idea of running a marathon some thought and respect," says Andy Dixon, editor of Runners World magazine. "People shouldn't underestimate the challenge and just amble up to the start line." Commit to training.Dixon says on average people put 16 weeks of structured preparation into running a marathon, and they will be running between four and six times a week, with a long run at the weekend. Eat properly.Runners undergo "carb loading" to build up their stores of glycogen, which acts as fuel. What people take on during the race is also important - sports drinks with glucose, energy gels, even jelly babies, as well as plenty of water. Pace yourself.If you set off too fast you are setting off a ticking time bomb, says Dixon. "With all the cheering it's instinctive to want to go off like a rocket," he adds. Don't think you can imitate Jedward.The fact that Jedward were club athletes and good standard runners in their youth, says Dixon, and their stage act will give them a high level of cardio-vascular fitness. "Part of their schtick is they bounce around and are energetic, they strike me as pretty fit, they are not hugely hedonistic." And yet he did not entirely tackle the marathon from scratch. Although Ogle says he has no regular fitness regime, he normally runs about three miles a couple of times a week. Indeed, according to Dr Valerie Gladwell, a senior lecturer in sports and exercise science at the University of Essex, a person's basic level of fitness plays a big part in their potential. The Jedward twins were keen runners in their pre-fame days,according to a Sunday Times profile,competing in their local athletics club and coming 7th and 13th in an Irish schools' mountain running championships shortly before they came to public recognition. Gladwell says this history of fitness would have been crucial. "Jedward spend a lot of time being very active, they do a lot of dancing," she says. "Their cardiovascular systems are going to be OK, they will have reasonable muscle strength. "If people of their level of fitness get their fuelling right, if they keep their pace steady, they could probably do a marathon if they really wanted to, but it isn't something I'd recommend," she says. "From doing no training, their muscles wouldn't be accustomed to it. If they were going through an extra pain barrier they would risk injury through muscle strains and excessive wear and tear on their joints. "But if they went round slowly and listened to their bodies they wouldn't necessarily be at any more risk - as long as they are staying within their comfort zone and not doing it faster than they are capable of." John Brewer, professor of sports science at the University of Bedfordshire, agrees it is physically possible as long as the competitor has some experience of running and attempts it at the lowest possible intensity. "If you're a runner and your body is conditioned to running 5k or 10k in distance, as long as you set your goals properly and you run at a very slow pace, you could probably get around," he says. "If you walk briskly at 15 minutes per mile, that's six-and-a-half hours to do 26.2 miles - most people could sustain it." Interspersing walking with a small amount of running might shave another hour off the time, he says. "In today's world of mass-participation running with people fundraising in fancy dress costumes, you're not going to be the last to finish with a time like that." However, he cautions that, for those unaccustomed to long distances, recovery will be longer and more painful. Additionally, first-time runners who have eschewed health check-ups would run the risk of triggering any undiscovered medical condition. "I wouldn't ever recommend anybody tackling a marathon without proper training - you can't underestimate the physical effort and energy demands involved," he adds. Indeed, he is not the only one. Ogle believes anyone who wants do to a marathon should go for it, but he would not advise anyone to follow in his footsteps. "If I ever was to do one again, I'd train," he says. "Training needs real commitment. Personally I think training for a marathon is more of an accomplishment than running it."